The Marshall© 4104 Combo (circa 1982) with two Celestion© G12-65 12" Speakers is the Combo version of Marshall's renown JCM-800 50 Watt 2204 Amplifier Head. The amplifier sports  12AX7 Preamp tubes,  12AX7 inverter and  EL-34 Power Tubes controlled by a preamp gain and MASTER Volume control. This amp is very loud... being a 30 year old amplifer, some service is required... as follows! 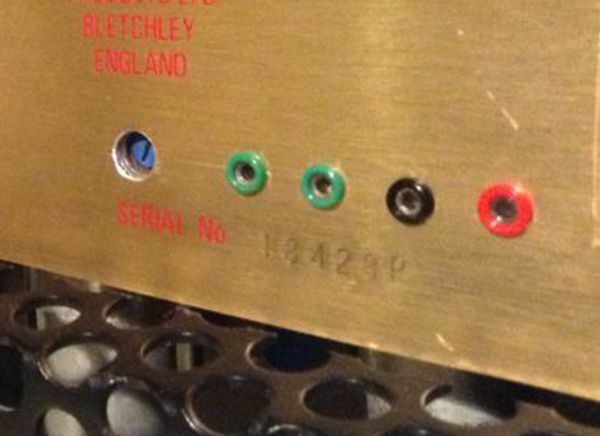 The Amplifier was modified to allow power tube bias adjusments without having to open the chassis, which is a very time consuming process... 4 test points (for Tube A Cathode Current, Tube B Cathode Current, B+ and Ground) were installed on the rear panel to allow easy monitoring of the power tube vitals. I installed 1% 1 Ohm resistors inline with both power tube cathodes to help determine the cathode current when the tubes are operating, The cathode current is close to the plate current of the power tubes so the plate dissipation can be approximated if you know the B+ voltage. The 1 Ohm resistors allow you to read the representative Cathode current in mV. (i.e. 30 mV reading = 30 mA Cathode Current). The two wires coming from the tube side of the 1 Ohm resistors goes to the two GREEN Test point on the rear-panel. The BLACK Test point is GROUND. A 1 % resistor divider, that scales the B+ down by a factor of 10000 and allows a safe measurement of the B+ with the 200 mV scale of a volt/ohm meter. That mV voltage goes to the RED Test point on the rear-panel. The BLACK Test point is GROUND. The dissipation is an easy calculation of Plate Voltage x Cathode current allowing proper bias adjusment using a multi-turn bourns potentiometer accessible from the rear panel. The Speaker Board was removed from the cabinet and painted flat white. The Marshall Speaker Grille Fabric was removed from the board and a new Steel Grille was ordered from TCH©. This Grille is cut and folded to my dimensions so that it fits perfectly. The Rear Wood Panel that protected the tubes was moved down and a New Steel grille was installed to protect the tubes... Convection cooling is better when there is more space for air-flow... therefore keeping the tubes cooler. The Metro Amps© Zero Loss FX Loop is the most transparent loop available for installation in Marshall Amps... This Loop uses High Voltage FETs to ensure that the Loop is never overloaded. This is because the loop can handle the High Voltages from the Phase Inverter and can ensure that the power tube section is driven accordingly. There is a small toggle switch to bypass the loop. The Electrolytic Power Filter Caps and Bias Capacitors were replaced in this amp as is customary for an amp that is over 25 years old. The snubber is a network of resistors and capacitors that filter very high frequencies. These high frequencies are not in the audio range and must consequentially be managed before the output transformer's secondary; lest possibly driving the transformer into saturation before it really needs to. The snubber circuitry connects between the two primary windings on the output transformer.